Randy Alcorn writes about the pro-life issue. Because it’s important. John McCain wasn’t my first choice for president. I am deeply concerned about the one, two or possibly three Supreme Court justices to be appointed in the next presidential term. If you listen to the candidates, it’s obvious that McCain/Palin would make a concerted effort to choose justices likely to reverse Roe v. Wade and it is equally obvious that Obama/Biden would choose justices most likely to uphold Roe v. Wade. . . The blood of week and needy unborn children is precious in God’s sight. Please don’t tell me abortion isn’t the only issue. Of course it isn’t. Treatment of the Jews wasn’t the only issue in 1940 Germany. Buying, selling and owning black people wasn’t the only issue in the United States of 1850. Nonetheless, both were the dominant moral issues of their day. Make no mistake about it. In our own day if we support a candidate who defends abortion, who is dedicated to that cause, we are supporting the killing of children. Yes, even if he’s the coolest candidate to come along in decades. We will stand before the judgment seat of Christ for our decisions, and a vote is a decision in which we assume responsibility for the known beliefs and moral positions of the candidate. 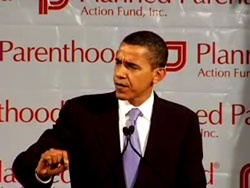 This is not speculation, it is not a spin, it is demonstrable fact: Barack Obama IS adamantly committed to continuing the legalized killing of unborn children in this country. . .
We may want to show the world that we Christians are cool enough to support the coolest political candidate who’s come along in decades. I really wanted to. But I just can’t get past child-killing. That’s a price for coolness that’s just too high. . .